Elisha, a young man, works hard on his father's prosperous farm, a farm which he will some day inherit. When the prophet Elijah visits Elisha and tells him that he will be the new prophet of Israel, Elisha, obedient to God, leaves the farm to follow Elijah. Elijah teaches his new student, knowing that his days on earth are few. Despite Elijah's efforts, the kings of Israel continue to worship idols and not the living God. In Elijah and Elisha's wanderings, they come to the River Jordan. Elijah spreads his mantle on the waters, and God parts the river so that the Prophet and student may cross. Elisha, doubting that he will ever be able to take his teacher's place, asks for a double portion of Elijah's spirit, which he promises to his student if Elisha sees him taken to Heaven in a chariot of fire. Elijah tells him never to take a reward for the works of God, for God is the only miracle worker. Just as the Prophet had foretold, God sends for Elijah, and as he ascends, throws his mantle to Elisha. 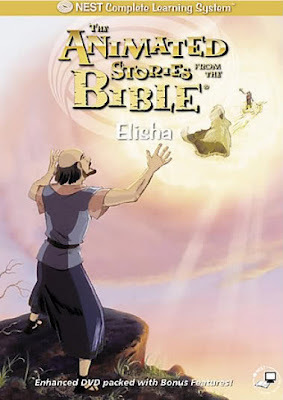 Elisha parts the River Jordan with Elijah's mantle. He begins his days as the next great Prophet, performing miracles and spreading God's commands and love. Elisha and his servant, Gehezi, wander the country. The water supply of a great city has been poisoned. God tells Elisha to spread salt on the waters. When he does so, God cleanses the water. "Thus sayeth the Lord, I have healed these waters, and death will not come from them again." When offered great wealth for his miracle, Elisha, to the dismay of Gehezi, refuses. As a fiery chariot from heaven took away the great prophet, Elijah, his mantle fell upon his frightened protégé, Elisha. From then on, Elisha would be God’s mouthpiece. You can buy this DVD from the below link.